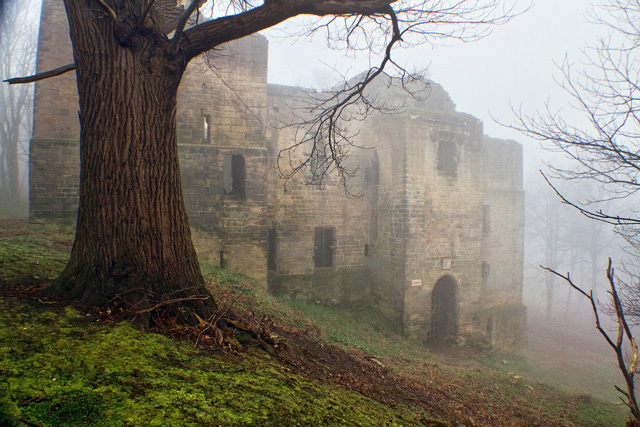 Notes: Harewood Castle is a 12th-century stone hall house and courtyard fortress, located on the Harewood Estate, Harewood, in Leeds, West Yorkshire, England (Grid Reference SE 322457). Harewood Castle is a grade I listed building. Recent times saw decay and weathering take their toll, and the unstable castle was placed on the Buildings at Risk Register by English Heritage. Then, around the year 2000, a 1 million rescue plan was drawn up, funded partly through English Heritage and partly by the Harewood Estate. As of 2008, the restoration project, which involved architects, geologists, structural engineers, ecologists and staff of the Harewood Estate, Historic Property Restoration Ltd and English Heritage, was nearing completion. The castle was taken off the Buildings at Risk Register in that year. Historic England. "Harewood Castle (53091)". PastScape.